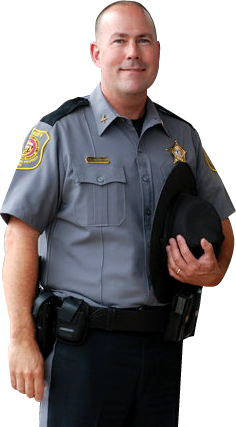 Elected your Sheriff in November 2006 and returning as your dedicated, responsive and accountable Sheriff in 2010. Dedication, Persistence, fiscally responsible and Compassion describe the past 27 years of my career. Long before suggestions by administration were made to resolve community issues, I spent countless hours dealing with and resolving community concerns. This was not typical of most law enforcement officers or agencies. I have continued to listen to the concerns of our local community and businesses. The community does not want to think they are “bothering” the police, but want resolve to their complaints. The community expects the primary law enforcement agency that responds to be completely approachable, providing “Prompt, Professional and Courteous Police Services”. As a Law Enforcement manager and leader I have continually analyzed and resolved the complaint or concerns so many community members have consulted in me. This may have meant working with other forms of local or state government and officers to resolve the issue. As the last eight years have brought many accomplishments to our community the work is not complete, and never will be. Your Sheriff has to be a visionary, seeing the needs for constant change, listening to you and being able to evolve to the changes that occur daily. I have continued to demonstrate that ability, and the work will continue. Ensuring that the position of your Sheriff is a career, and not a part time position, you have seen me at work, and community events consistently for the past 21 years! In fact, many of our residents have called upon me 24 hours a day, 7 days a week for the past 21 plus years. As your Sheriff, it’s expected, that I am accountable and listen to you, and continue to address your needs. I am aware that “Community Policing” is an old philosophy of dealing with community issues; however it seemed that law enforcement was operating in a reactive response, instead of proactive response. If we (deputies) identify problems, take a firm stand on resolving them the first time; we will make a difference in quality of life issues. I am a firm believer that we need to solicit information from the community, they know what the concerns are, and with our data we can quickly and efficiently resolve the issue. Current crime trends are evaluated daily, targeting those who target you, my community. This information has led to our staff addressing many crimes and issues. I have implemented proven strategies with our Seniors, Children, Schools, Business’s , Community and staff. We don’t just respond, we create a changing plan to address crime and issues today, not waiting for someone else to address them later. This is the proven foundation of a strong leader and communication building blocks for our county’s continued future. I believe in my past, and know that we have a future in our community. In law enforcement, traditionally we only meet the 1% of the population that causes the police response; however I can say that working with the other 99% of the community, has made me a believer that together we are creating a greater community. I look forward to being your Sheriff for another great four years. I encourage you to call me, visit your Sheriff’s Office and look over this web page. Can you take a chance on the unknown candidates with the future of our families, children, seniors and the future of this great county? I will continue to be responsible and responsive to your needs, resolving issues within our community, the other opponents are “nice guys” but can you take a chance on the other candidate? The success you have seen, the positive changes and reduction of crime are only the beginning to our future. We hold criminals responsible, demand the most from our staff and expect accountability on our performance, all demonstrated daily! Thanks for your vote of confidence in your office, Thanks for voting for me to represent you! After graduating from High School, Gary took a different approach to higher education. Gary began training for his lifelong goal of becoming a police officer to aid and protect all citizens. That was 29 years ago, and today he is still as passionate and dedicated, knowing this is a career and not a retirement position. Gary is very proud to have been selected in December 2008 to participate in the January 2009 Class of the FBI National Academy Class 236. Less than 1% of all Law Enforcement Officers World Wide are selected for this honor. Participation is by invitation only through a nomination process. Participants are drawn from every State in the Union, from US Territories and from over 150 International Partner Nations. This was an intensive 10 week course held at the FBI Academy in Quantico Virginia. Courses were taught by the Federal Bureau of Investigation and the Drug Enforcement Agency. In March of 2009, Gary graduated from the FBI National Academy. * Question asked at a 2010 League of Women’s Voters Forum, “Please tell us your educational and professional background that qualifies you for Office of the Sheriff.” Although this is not my entire resume, I believe this should answer her question. Education Makes A Person Knowledgeable. Your vote for Gary Hofmann on June 24th will ensure a continued uninterrupted plan of leadership for your family and a safe and secure community!